Synopsis: Based on a true story. A team of African-American women provide NASA with important mathematical data needed to launch the program’s first successful space missions. Unconscious or not, there seems to be a proliferation of quality roles for African American actors in this year’s Academy Awards races in response to the “Oscars So White” controversy of 2016. Frontrunners include movies like Moonlight, Loving, and Fences. Another title can be added to that pile with Hidden Figures. 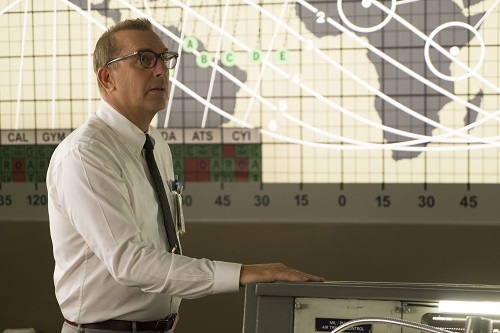 Ostensibly, Hidden Figures is about the space race to put a man into orbit in the early sixties. But, it’s really about the struggles of three brilliant African American women who had the brains to help pull it off. Katherine G. Johnson (Taraji P. Henson from “Person of Interest”) is a child prodigy mathematician who is brought in to do essential calculations that no one else can figure out. Dorothy Vaughan (The Help‘s Octavia Spencer) works to implement a necessary IBM supercomputer into NASA that can speed up and condense human workloads. Mary Jackson (Janelle Monáe from Moonlight) is a physicist and mathematician who tests and troubleshoots the mechanical engineering side of the project. Together, the women have to stave off racial prejudices as they work towards the common goal with the white folks around them. Based on the book of the same name by Margot Lee Shetterly, Hidden Figures was adapted for the screen by writer/director Theodore Melfi (St. Vincent) and co-writer Allison Schroeder (Mean Girls 2). Hidden Figures is one of those movies where the entire audience knows the outcome of the story, but few will know the underlying events. 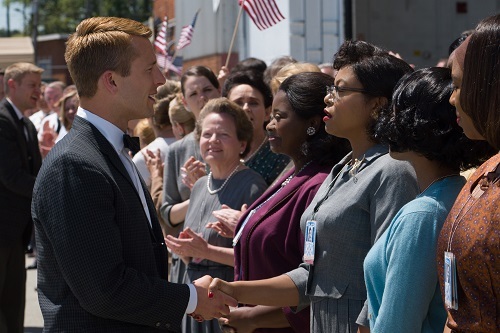 We all know John Glenn got into orbit, but Hidden Figures shows how the only analytical calculations that the astronaut himself trusted came from a black woman (two disadvantages in the white man’s world of 1962). There’s very little subtlety in Hidden Figures. The racial divide is hammered home right from the beginning of the film, and the inevitable-yet-slow understanding that all people, regardless of race or gender, are equal is pounded in hard as well. Hollywood vet Kevin Costner (Draft Day) plays the sparkle-toothed, white-hat wearing hero when, as one of the NASA project heads, he learns that the heroines have to walk to the other side of the campus to use the “colored” restrooms, and he symbolically tears down the “whites” sign over the restroom, creating a race-neutral space for the ladies to, well, do their lady stuff. Of course, it’s also symbolic that, while he’s doing this, his staff is divided into two groups – one white and one black – as they watch. Inevitable-yet-slow understanding. 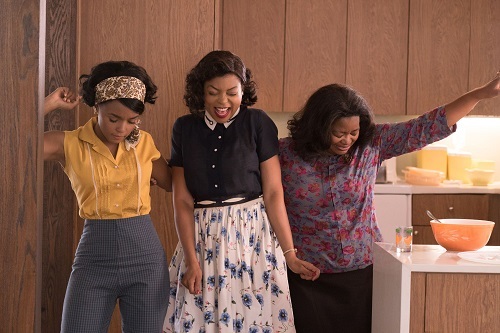 As heavy-handed as it is with its agenda, Hidden Figures is an enjoyable movie. It’s predictable, saccharine sweet, and takes few chances, but it still keeps its heart firmly in the right place. It’s the very definition of a feel-good movie. Hidden Figures is a pure ensemble movie. It would be easy to believe that Taraji P. Henson’s Katherine would be the lead, but Octavia Spencer’s Dorothy and Janelle Monáe’s Mary share just as much screen time and offer up equally heroic character arcs. All three actresses are great, both by themselves and when they are onscreen together. For his part, Kevin Costner plays the knight in shining armor as well as he ever has. The ladies are also supported admirably by Kirsten Dunst (Melancholia), Mahershala Ali (Moonlight), Aldis Hodge (Straight Outta Compton), and, in a bit of typecasting that’s either brilliant or idiotic, Jim Parsons as basically his “The Big Bang Theory” character. None of the roles in Hidden Figures are stretches for the actors in them, but they are juicy enough to garner some awards buzz, so it wouldn’t be a surprise to hear a few of these names come Oscar nomination time.